As our little fun Gingerbread holiday bits and pieces go back into boxes, one place has the fun year round. Walking through our local Antique store this weekend we were greeted with a smiling face of a new Gingerbread Man pitcher. Well, new to us, it’s a few years old. Looking around, we saw all kinds of fun Gingerbread items we just can’t live without. Some are very holiday based, others are cute kitchen items that will look great year around. 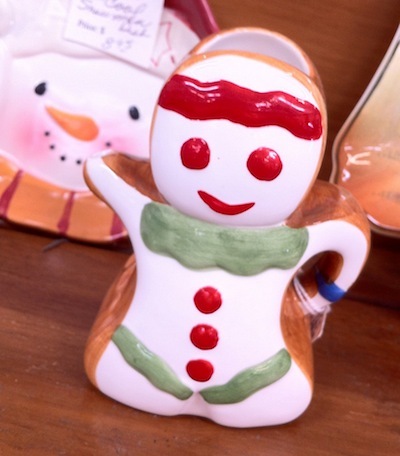 Need a Gingerbread Man fix, just buzz by your local Antique store. Copyright © 2019 Gingerbread Fun. All Rights Reserved.